Today, I'm playing along with the latest PinSights Challenge at The CLASSroom, where we're using this colour palette - Drama Queen. 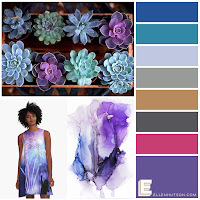 I focused on the succulents - I just love how those colours seem to blend seamlessly together. 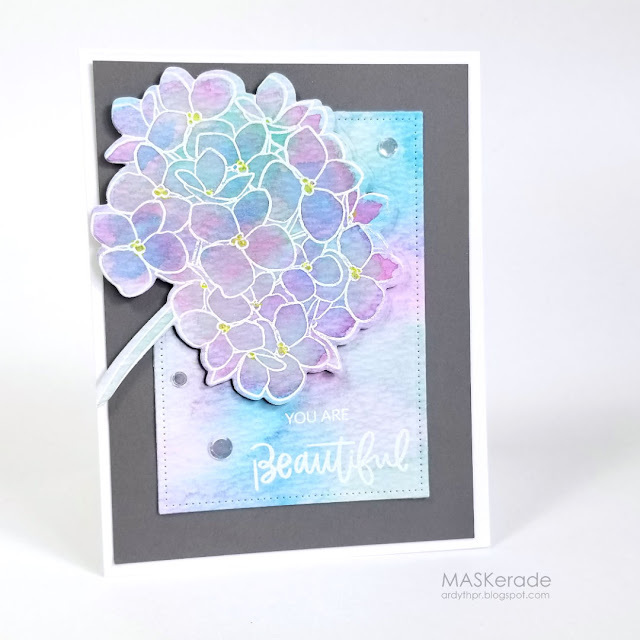 To achieve this look, I layered up my colours, which is very easy to do with Distress Oxide inks. I started by cutting a 4.25x5.5 panel of Ranger Watercolour cardstock. I smooshed various colours of Distress Oxide inks onto my Ranger non-stick craft mat and used the ink with lots of water to create a pretty washed background. I did two layers of this, drying in between layers so that the colours didn't get muddy. Next, I embossed Mondo Hydrangea with Brutus Monroe Alabaster embossing powder. I smooshed more Picked Raspberry onto my 'palette' and added another layer of colour to each of the flowers. I love how the blues and greens underneath show through the pink. I used the matching die to cut out the hydrangea and then cut the remainder of the panel with a pierced rectangle. I adhered the panel to a larger gray panel and then popped up the flowers. I coloured the flower centres with a yellow Zig Clean Colour marker and added touches of Stickles for some sparkle. The sentiment is from the new Strong stamp set and is also embossed with Alabaster. Ardyth, you've managed to get the true look of a hydrangea in coloring...the kind that sits in soil that is both acidic and base so it is neither truely blue nor pink. Fabulous. What an exquisite card Ardyth - love the beautiful colouring of the hydrangea and the the soft wash background. The color you achieved is beautiful, Ardyth. It looks like the Mondo Hydrangeas are going to get a workout for this challenge. I am so loving your use of this flower, I have to get mine out again. The colours you are getting make me think of mums garden and the two great bushes of these flowers that were just this colour. Stunning design and love how the colour continues into the background.